Bethesda, MD, 2019-Apr-11 — /Travel PR News/ — Following the highly anticipated announcement of Gather by JW – the brand’s immersive epicurean and mindful experience this September – JW Marriott today unveiled ‘Gather by JW’ Marriott Bonvoy Moments exclusive for members. These bookable packages, available to bid on now through May 1, will allow Marriott Bonvoy members the opportunity to indulge their inner foodie through thoughtfully curated and unforgettable experiences, including Masterclasses, with top names in the culinary world. Gather by JW, JW Marriott’s second annual festival in Venice, will take place from September 26 – 29, 2019 at the enchanting JW Marriott Venice Resort & Spa, located on the private island of Isola delle Rose. The weekend will bring together an incredible roster of culinary, beverage, and mindfulness experts to curate an immersive experience that celebrates gathering, being present, Marriott Bonvoy Moments Masterclasses led by award-winning culinary legends and wine aficionados, and of course, food and wine. Talent includes Fabio Trabocchi, Giada De Laurentiis, Ciccio Sultano, Angela Hartnett, Jonathan Waxman, Ray Isle, Anthony Giglio, and more. Through Marriott Bonvoy, the company’s recently unveiled travel program which replaced Marriott Rewards, Starwood Preferred Guest (SPG), and The Ritz-Carlton Rewards, members can bid on exclusive ‘Gather by JW’ Marriott Bonvoy Moments. Starting at 75,000 points, these packages feature luxurious three-night accommodations for two guests in a Junior Suite at JW Marriott Venice Resort & Spa. Each Marriott Bonvoy Moment provides festivalgoers with access to Masterclass cooking schools with award-winning chefs and additional Gather by JW experiences including two seats at the coveted IL FINALE dinner, an all-star feast held in the resort’s stunning church that will bring together the festival’s top chefs and wine experts. Package 1: ‘Essentially Giada’ with Giada De Laurentiis: Moments members can don an apron as they sharpen their culinary skills through an immersive Masterclass hosted by chef, author, and Emmy Award-winning television personality, Giada De Laurentiis. Participants will cook alongside Giada and learn from her as they prepare classic and flavorful Italian dishes with a contemporary California twist. For more information, or to bid on the ‘Essentially Giada’ Marriott Bonvoy Moment, visit Marriott Bonvoy Moments. Package 2: ‘Decadent Nonna’ with Angela Hartnett: Members can enjoy a passionate Masterclass presented by award-winning chef, Angela Hartnett. ‘Decadent Nonna’ will incorporate the flavors of Hartnett’s Michelin-starred London restaurant Murano into classic and nostalgic dishes inspired by her childhood. For more information, or to bid on the ‘Decadent Nonna’ Marriott Bonvoy Moment, visit Marriott Bonvoy Moments. 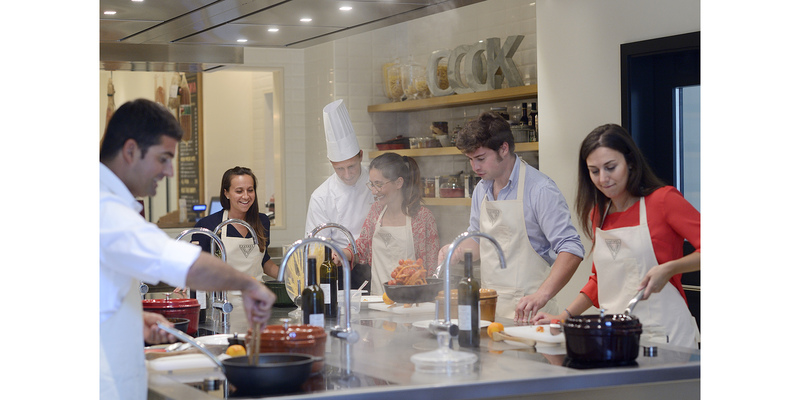 Package 3: ‘The Sicilian Kitchen’ with Ciccio Sultano: Chef and owner of the two Michelin-starred Ristorante Duomo in Sicily, Ciccio Sultano will provide participants with a hands-on Masterclass demonstration. Sultano will divulge his secrets on how to create the most mesmerizing dishes inspired by his award-winning Sicilian restaurant, Il Duomo. For more information, or to bid on the ‘The Sicilian Kitchen’ Marriott Bonvoy Moment, visit Marriott Bonvoy Moments. These exclusive Moments are only available at Marriott Bovoy Moments. Each Moment includes resort activity fee, complimentary Wi-Fi, and daily breakfast at Cucina Restaurant. Airfare is not included. Members must be 18 years or older to bid on ‘Gather by JW’ Marriot Bonvoy Moments. For additional information on ‘Gather by JW’, please visit www.gatherbyjw.com. JW Marriott is part of Marriott International’s luxury portfolio of brands and consists of beautiful properties and distinctive resort locations around the world. The impressive array of award-winning hotels cater to sophisticated, mindful travelers seeking The JW Treatment™ – the brand’s philosophy that true luxury is created by people who are passionate about what they do. These experiences help guests to be fully present, foster connections and feed the soul. Inspired by the principles of mindfulness, JW Marriott is a haven designed to allow guests to focus on feeling whole – present in mind, nourished in body, and revitalized in spirit – through programs and offerings that encourage them to come together, act with intention and experience every moment to the fullest. Today there are over 80 JW Marriott hotels in more than 25 countries and territories. Visit JW Marriott online, and on Instagram and Facebook. JW Marriott is proud to participate in Marriott Bonvoy™, the new name of Marriott’s travel program replacing Marriott Rewards®, The Ritz-Carlton Rewards®, and Starwood Preferred Guest®(SPG). The program offers members an extraordinary portfolio of global brands, experiences on Marriott Bonvoy Moments and unparalleled benefits including earning points toward free hotel stays and nights toward Elite status recognition. To enroll for free or for more information about the program, visit MarriottBonvoy.marriott.com. Settled on its own private island in Venice, Isola delle Rose, just a quick ride to St. Mark’s Square by complimentary shuttle service, JW Marriott Venice Resort & Spa is the ultimate luxury experience for the most discerning traveler. The combination of wide and lush green areas, a refined restoration by award-winning architect Matteo Thun, together with an attentive service and the finest wellness and dining experiences makes Isola delle Rose a serene retreat from where you can easily explore the beauties of Venice and at the same time indulge in the luxury of a resort. Opened in 2015, the Resort features 266 rooms and refined suites, 4 restaurants – including the fine dining restaurant Fiola at Dopolavoro Venezia, by Michelin-starred Chef Fabio Trabocchi – and 4 bars offering international and local cuisine, the largest Spa in Venice, a Church, kids club and family activities, water sports, a rooftop lounge area with pool and view over Venice, lush green areas, and Sapori Cooking Academy for gastronomes looking to experience the authentic Venetian lifestyle and atmosphere. Visit JW Marriott Venice online, and on Instagram and Facebook. This entry was posted in Business, Hotels, Luxury, Resorts, Travel, Travel Deals, Travel Management, Travel Services, Travelers and tagged Gather by JW, JW Marriott, Marriott Bonvoy Moments, Marriott International. Bookmark the permalink.